Hartlepool Sat Nov 30th – Ban the Burks! Following their wash-out in Wakefield on Saturday, the EDL are trying again to muster more than double figures in Hartlepool this Saturday by the cunning strategy of inviting any old Nazi on their demo. So Hartlepool will unfortunately be an unwilling host to not only the EDL but also the North East Infidels and various other hangers-on – folks who quit the EDL because it wasn’t right-wing enough for them. The supposed point of this parade of racism is to ‘Ban the Burka’. On Saturday we will no doubt be witness to the rabble of the EDL failing to see any irony as they shamble up the High Street covering their faces with pig masks, gimp masks, EDL branded balaclavas etc etc. Clearly none of which could possibly be hiding a terrorist despite the numerous acts of terrorism in which EDL supporters have been implicated. 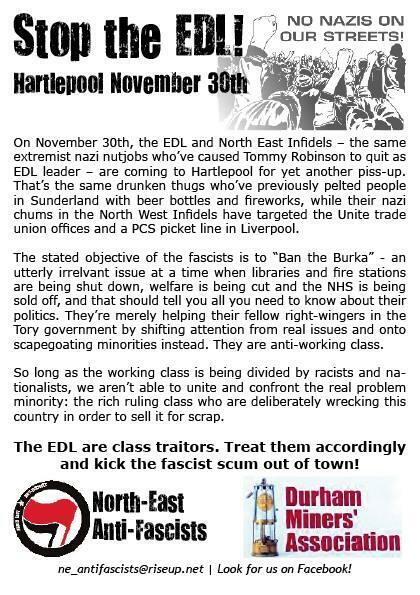 In response to their call to ban the burka, North East Anti-Fascists are asking people to mobilise on Saturday to Ban the Burks! Join them on Saturday to show the EDL and their far-right chums that they are unwelcome anywhere they go and are finished as a street movement. Several fascist pages are advertising 30th November in Hartlepool, we know the police have been contacting landlords, and the NE infidels leader Warren Faulkner has been meeting with the police regularly. Apparently they are organising a ‘Ban the Burka’ event, not that there are many/any Burkas in Hartlepool, but having no reason for a demo has never stopped them before. What possible reason is there for this event to be in Hartlepool above other areas? There is none. This is in central Hartlepool – and this call out is asking for people to get to Hartlepool for lunchtime on 30th November for the anti fascist protest, precise details for our mobilisation to be released closer to the time. As on the 30th of November the EDL, Infidels, EVF, SDL, Casuals, NF and perhaps more will be in Hartlepool (approx. 2/300 of the fuckers), so this now becomes our priority for the day. We do want to build anti fascist solidarity as far as we can as well. Transport will be arranged and we are laying on one bus at least from Newcastle. We are encouraging a full turn out from Yorkshire comrades too. There are a number of reasons to object to the Infidels and the other racists & fascists, whether it is their racism, their backward ideas, and we all know the dangers that such mobilisations of drunken racists and fascists bring to all, but especially those of Asian heritage. Therefore we call on all progressive & sound thinking people to oppose the spread of such racism & ignorance; to confront the fascists and to show that there is a better way than mindless prejudice and hatred, and to campaign together for a better life for all. Unity is our solution and solidarity is our method, contact the North East Anti Fascists to get involved. Please plan to be in Hartlepool for around 12, exact details to follow.